Great headless Jersey Covered Male 3/4 Torso Form with flexible arms for your dress maker or store display needs. You can change the pose by adjusting the arms and fingers at any time. 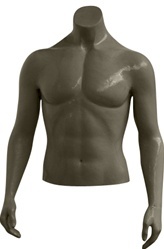 Soft male 3/4 torso form is pinnable. Black jersey fabric covers the body and arms. Arms are removable for easy dressing. Ships complete with brushed metal base.